Enhance your look when you brighten your smile with Crest 3D White Radiant Mint whitening toothpaste. Designed to remove up to 80% of surface stains, Radiant Mint toothpaste delivers whiter results with cooling freshness. Using an enamel-safe whitening formula, Radiant Mint toothpaste softly polishes away stains with small, micro-cleansing whiteners as the gentle foaming action helps whiten even the hardest-to-reach places. 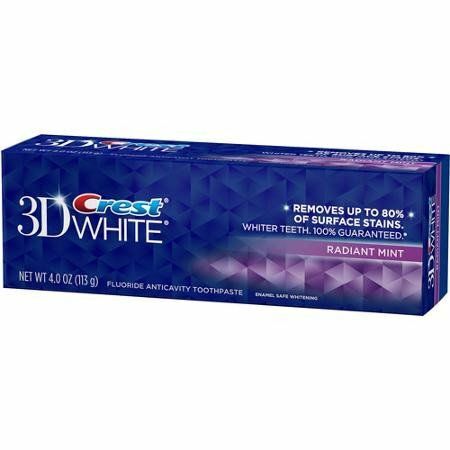 For a whiter smile and fresher breath, try Crest 3D White Radiant Mint whitening toothpaste. Minty Fresh Breath. Dazzling White Smile. Removes up to 80% of surface stains. Radiant Mint flavor for fresher breath. Ingredients: Active ingredient: Sodium fluoride 0.243% (0.15% w/v fluoride ion), Inactive ingredients: water, sorbitol, hydrated silica, disodium pyrophosphate, sodium lauryl sulfate, flavor, cellulose gum, sodium hydroxide, sodium saccharin, carbomer, mica, titanium dioxide, blue 1. Instructions: Adults and children 2 yrs. & older: brush teeth thoroughly after meals or at least twice a day or use as directed by a dentist., Do not swallow. To minimise swallowing use a pea-sized amount in children under 6., Supervise children’s brushing until good habits are established. Children under 2 yrs. : ask a dentist., Get a Whiter Smile in 2 days*., *Whitens by removing surface stains when using any Crest 3D White Toothpaste (except Crest 3D White Luxe Sensitivity Toothpaste and Crest 3D White Brilliance Boost ), Crest 3D White Multi-Care Whitening Mouthwash, and Oral-B 3D White Pro-Flex Toothbrush.